It is with regret that MAG Ireland announces the resignation from the board of one of its longest serving members. After more than 15 years in the organisation, Linda O’Loideoin has decided to step away from MAG Ireland activities for personal reasons with board member Peter Bartlett taking on the treasurer role. From MAG Ireland’s humble beginnings in a makeshift office (literally! It was a garden shed! 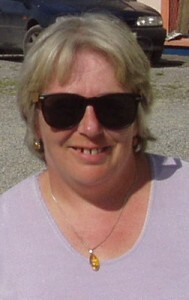 ), Linda has volunteered her services as Office Administrator. Little were we to know at the time that she was to become such a crucial cog in the MAG Ireland wheel and over a 15 year period she undertook roles including Road Safety Officer, Campaigns Officer and Public Relations Officer before finally taking on the esteemed position of Treasurer. The challenge to engage at European level on issues of riders rights was a natural transition for Linda and she quickly became a respected authority on the subject. 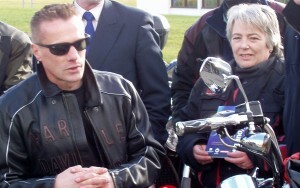 Linda has regularly represented MAG Ireland at meetings of the Federation of European Motorcyclists Associations (FEMA) in Brussels and became a well known advisor in the European riders rights community. “My proudest achievement would be MAG Ireland making a complaint to the Competition Authority around 2005 about the lack of competition in the Irish Insurance market. We got an acknowledgement from them and then heard nothing for 18 months until George Lee discussed a report from the Competition Authority on RTE where he mentioned that motorcycle insurance had risen by 100% in the past year. A few days later we received a letter from the Competition Authority upholding our complaint. They had instructed Mary Harney (then Minister for Enterprise, Trade and Employment) to rectify the situation. Shortly thereafter Quinn Insurance was granted a license which included the sale of motorcycle policies. Adelaide was also granted a license even though they didn’t have a registered office in the Republic of Ireland – a requirement under the 1967 road traffic act, and one of the key points in our original complaint. Like any voluntary organisation with little resources that sets out to lobby on behalf of many, MAG Ireland has been through the good and the bad, the ups, and the downs. The ability to adapt and make the best of the bad times as well as capitalising on the good is an essential one. Without doubt Linda has made the best out of very little in the way of resources and overcame the many difficulties MAG Ireland had to combat. 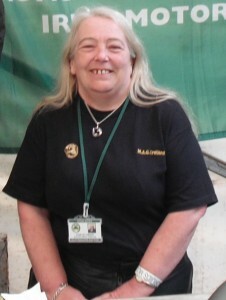 Today MAG Ireland continues to evolve to meet the needs of a new generation of riders and as Treasurer Linda has ensured that evolution was as smooth as possible. She has also helped to build a new, competent and professional board and as a consequence MAG Ireland can look forward to the future with confidence. Linda has given without thought for her own wants and it is due in a large part to her dedication and hard work that MAG Ireland exists and flourishes today. So after 15 years this lady has decided to call it a day. On behalf of the present Board I would like to express my deep gratitude and appreciation for her tireless efforts over the years. MAG Ireland would not be the organisation it is today without her. We wish her every success in the future. She will be missed.